You thought those personal blogs detailing every moment of some random person’s every day were annoying? 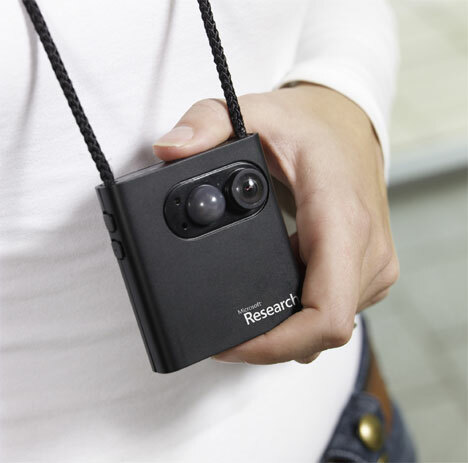 Get ready for an even more personal level of sharing: the Vicon Revue is a wearable digital camera that takes pictures all day with no effort on the user’s part. The first version released is a research model used as a “memory aid” for people with Alzheimer’s or other memory issues…but the consumer version will likely be used for photographic picblogging of the fascinating minutiae of strangers’ lives. The camera is equipped with a whole suite of sensors that tell it when to start snapping furiously. When the wearer’s environmental conditions – like the lighting level or ambient temperature – change, it snaps one pic per second. Otherwise, it takes a new picture every 30 seconds. If you’re the type of person who is inclined to record every second of every day, the Vicon Revue offers a simple way to do that without putting a lot of work into it. And since the camera is worn around the neck instead of held up to the face, it’s possible that the people you interact with will feel more at-ease than they would with a conventional camera pointed at them. See more in Camera & Video or under Gadgets. July, 2010.